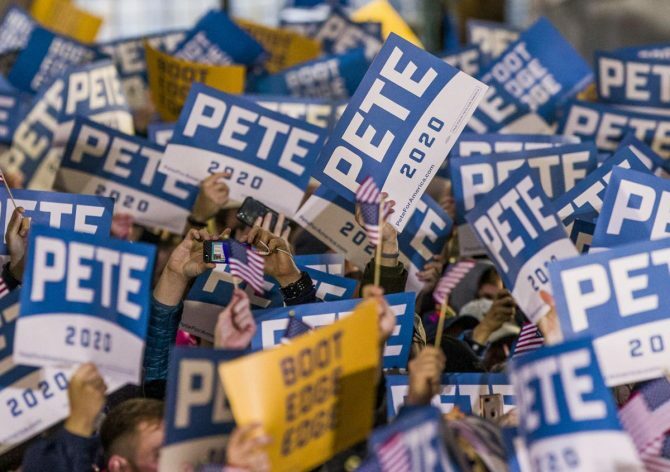 You’ve likely heard by now that Pete Buttigieg officially announced his candidacy for president during an impassioned speech in South Bend, Indiana on Sunday. During his 36-minute ceremonial speech, the openly gay Mayor of South Bend talked about everything from the economy to intergenerational justice to climate change to equality for all. At the end of the speech, he and his husband Chasten Buttigieg shared a kiss and received a huge round of applause from the crowd, as well as from people on Twitter. Oh, and then his campaign raised $1 million in, like, three hours or something crazy like that. It was pretty damn historic. It sends a message to every gay/queer kid in America that they can be out and proud, and achieve anything they want. Don’t know exactly why, but us Latinos love when when a non-Latino speaks Spanish. I think it has to do with community and pride for our culture. And we love Mayor Peter. Adelante, alcalde Pedro!!! The amount of love and support I see @PeteButtigieg getting from not only the people in South Bend warms my heart. I don’t think we could as for a better candidate for president, I’m so proud and so HONOURED to be apart of this movement. #PeteForAmerica ??? Without Obama and Hillary, there’d be no @PeteButtigieg. I’m thinking a lot about that right now. It’s not just the LGBTQ heroes that made this campaign possible— It’s anyone who challenged the norms of politics as we know it. That’s intersectionality at its best. I’m already seeing the negative takes, and today I’m letting them go without comment. Today an openly gay man officially announced his candidacy for President, was taken seriously and celebrated for it. I did not think I would see it this soon, if ever, and today I am happy. We need @PeteButtigieg so that people can associate Indiana with someone infinitely better than Pence !! Man what an exciting thing to see two men hug more than just half a second in front of a huge crowd. He is the real deal. Donation now! Fabulous. Let’s make america gay not again, but forever. Then Disney and Fox will get a hold of the speech and edit out the kiss. No words to properly express my pride over Mayor Pete. He’ll get my donation very soon! As a proud gay American I am so thrilled to see this day arrive. However, as amazing as it is and the joy in celebrating this time in our LGBTQ history, it is a LONG shot he will ever be elected and IF he is, the attack’s on the LGBTQ community by the far right wing TRUMPERS will be horrible. Mayor Pete has said that he is quite experienced in and fully prepared with dealing with the homophobes. Yes there will be lots of attacks but he can handle them just fine. Come on OhNoyou, You and many old folks have given too much credit to the Stonewall thing. Yes it triggered something bigger but that was needed at that time. Fast forward to 2019, we don’t need another riot or revolution. We already got gay marriage and we should aim for anti-discrimination rights going forward. Yeah, your concerns are valid. But, we must push on and face adversity head on. No foe will be too powerful to stop the Queer Rights Initiative, especially if we stay organized and smart. My comment about the attacks are not referring to Mayor Pete. It’s referred to about our community. This brings tears to my eyes. I cannot believe I have lived long enough to witness this event. I was 24 when Stonewall happened in June of 1969 and I knew even before then that it was going to be a very long and hard struggle to get civil rights for the Gay Community. But I have seen Gay Marriage legalized in 2015 and now, to see an openly gay man running for the highest office in the land. WOW!!! How amazing. WOW! I am ecstatic. Aside from the fact that he’s gay (which is awesome) he is the most intelligent, articulate, well-rounded candidate running. I have donated. I will donate again. And I will cheer this fine young man on to victory. You are so correct. I have seen several interviews with him and he is right on the ball with answers and NEVER dodges any of them. None of this beat around the bush crap that most politicians do. I wish him well. Already his supporters are as insufferable as BernieBots. So P-R-O-U-D! Hey America…donate Pete for America NOW! You bet! Every dollar helps in a grassroots contributions campaign. No amount’s too small. $3 a month would be great and immensely helpful. I’m very thankful that Mayor Pete’s in the race. His interviews, speeches, and writings show his drive to aspire to his longtime, multifacited dreams. And, he’ll be taking the LGBTQ community right along with him. What’s now happening is that his social cohesion is expanding exponentially to include a broad spectrum of our American demographic society. Doesn’t feel good, hopeful, and inclusive? There’s been some positive paradigm shift in the favorability ratings for Queers of late. And, Pete Buttigieg is our Knight in Shining Armor. Pete Buttigieg is not even in my top tier of candidates I will be supporting, but that was a great scene for sure.